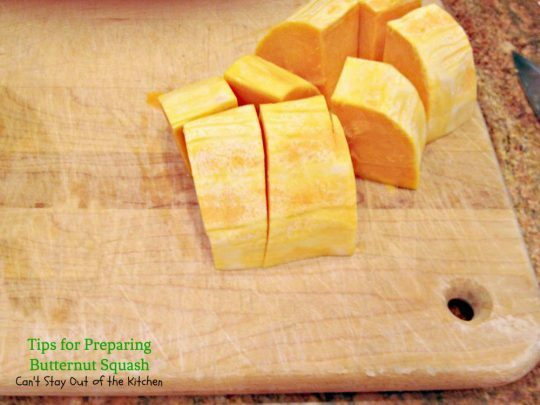 I was making Butternut Squash Bake for company the other day and realized there may be those who have never prepared butternut squash before and don’t know how to cook it, cut it up, or add it in recipes. So I thought I’d offer a little how-to-lesson on how I do it. 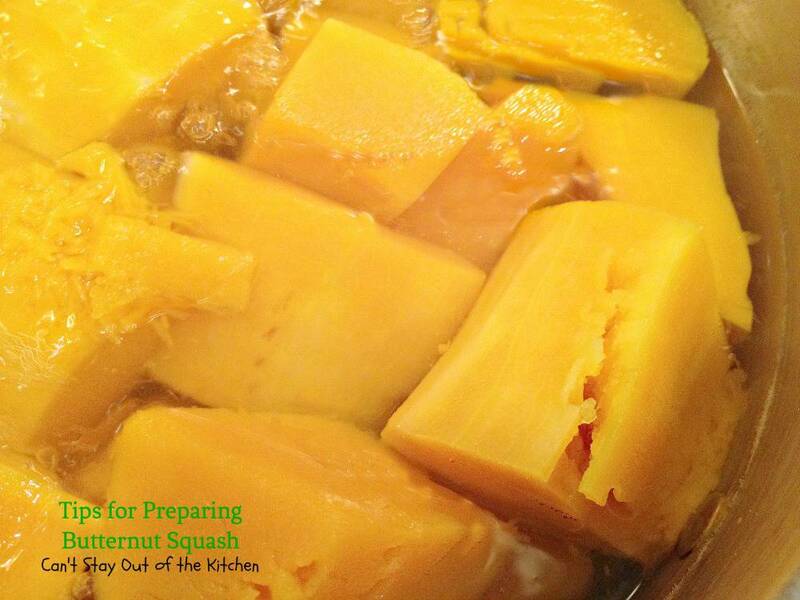 I’ve baked the squash and added it to recipes. I’ve boiled it, and I’ve added it freshly peeled to recipes. Any way works wonderfully. 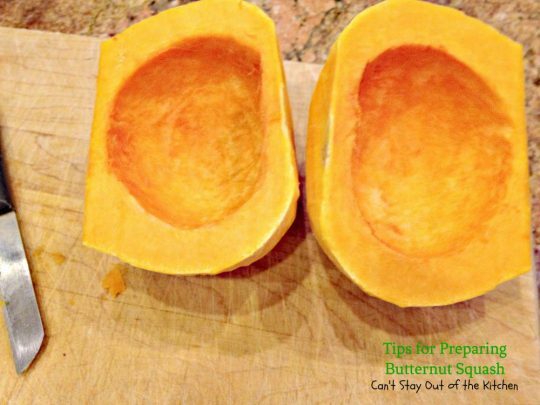 Once you’ve prepared the butternut squash you can use it in soups and bisques, casseroles, lasagnas, even pies and cakes. It’s a delicious squash that’s great to use for holiday baking. I have several recipes using it and I will try to get them posted up in time for the holidays! 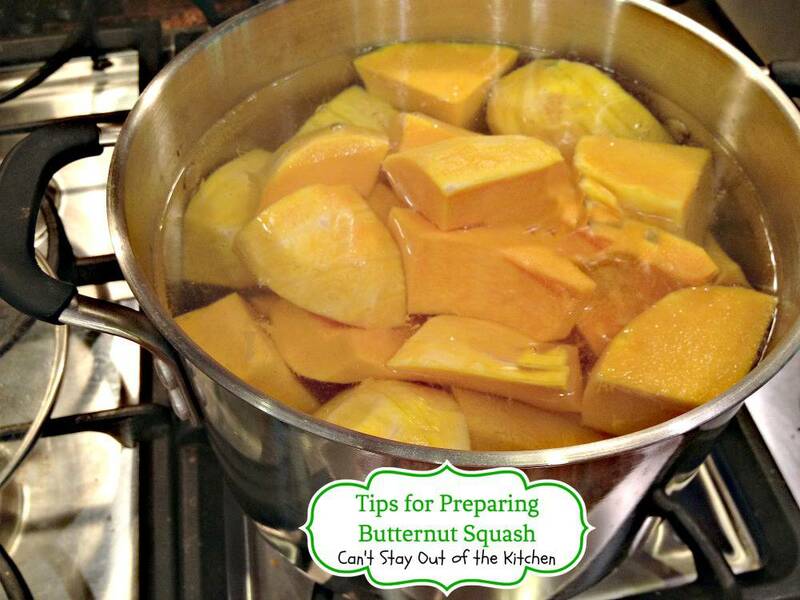 If you want to know how to prepare butternut squash than here are some cooking tips for you. Butternut Squash Bake is one of our favorite ways to use butternut squash. In Squash and Apple Bake I pare and slice the squash but bake it in the oven. Start by peeling your butternut squash. I prefer using a vegetable peeler rather than a knife to pare the skin. This peeler is the one that worked the best. 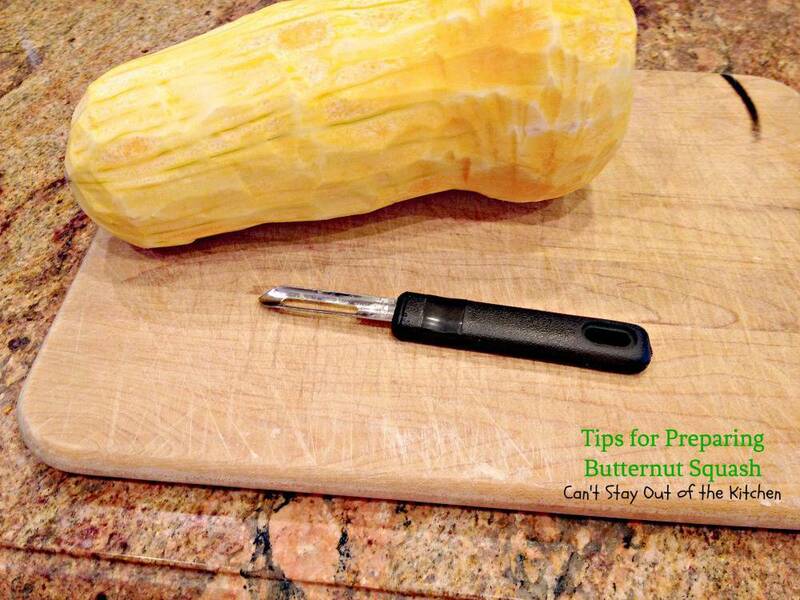 This butternut squash was a whopper and not easy to work with. I started by cutting into it about a third of the way. Be really careful with this step. The vegetable is dense and it is really hard to cut into them. Be careful not to cut yourself. I actually had to work my knife back and forth into it like a see-saw! Cut the squash down into smaller pieces to boil. The bulb part has all the seeds. 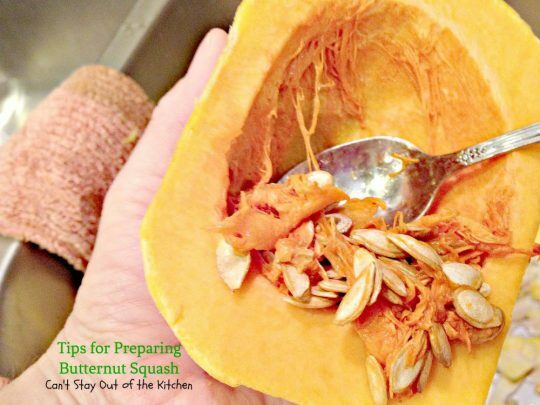 Remove the seeds with a spoon. Place in a pot of water to boil. 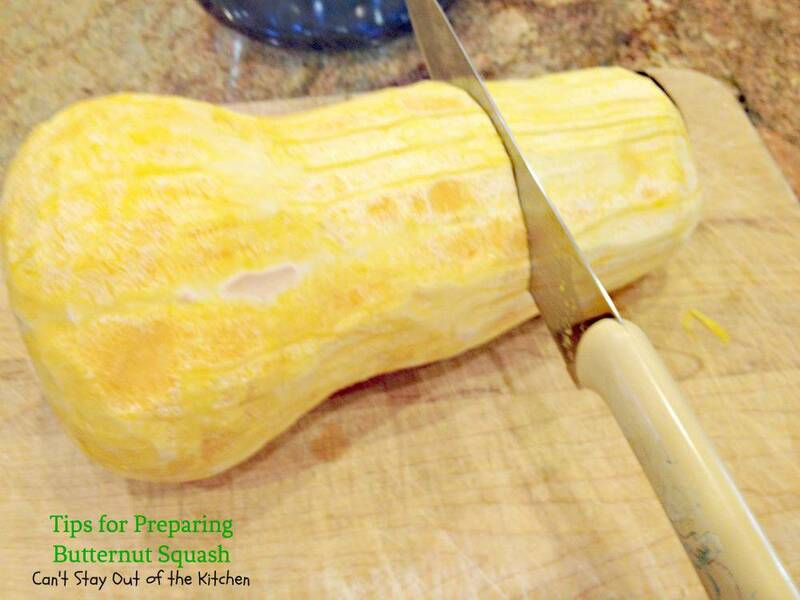 Test the squash for desired doneness. Pierce the squash with a fork. It will start breaking apart when it’s done. Drain water. You can save the water and use it for vegetable broth or add it to soups if you desire for a richer taste with a lot of vitamins and nutrients. 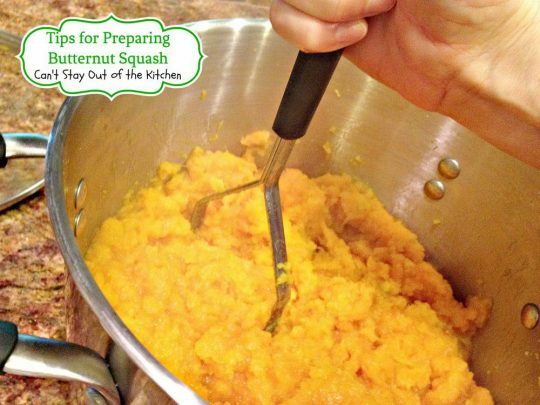 If your recipe calls for mashed butternut squash, begin mashing up the squash with a potato masher. This is my old-fashioned potato masher. I’ve had it a long time, but it does the job! Mash squash until completely mashed. This is what it looks like when finished. Some recipes will require a smoother more pureed texture. In that case you will have to use either a mixer or blender. I used the mashed butternut squash in my Butternut Squash Bake recipe. 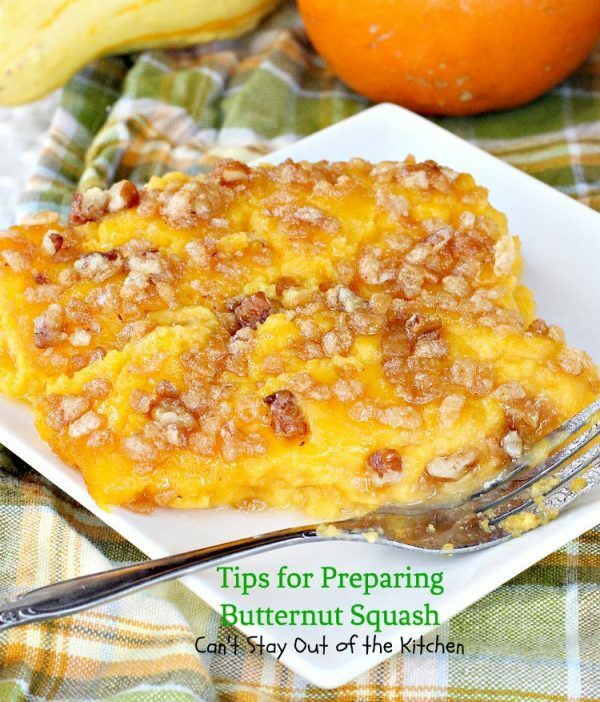 Butternut squash is a delicious vegetable that is versatile and can be put in lots of different recipes. I have savory recipes as well as sweet. 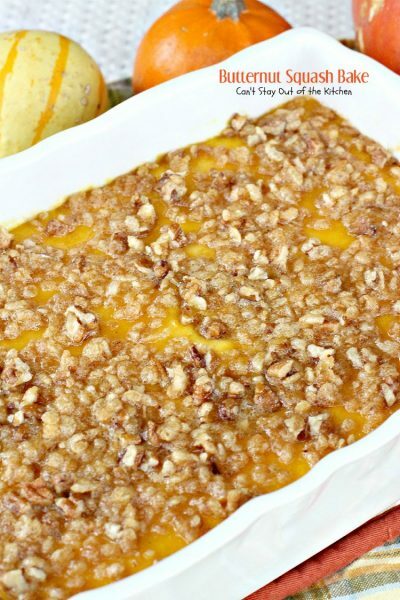 Mashing the squash is the way I use butternut squash for this Savory Butternut Squash Bake, too. In Butternut Squash and Pear Gratin I only peel the squash. 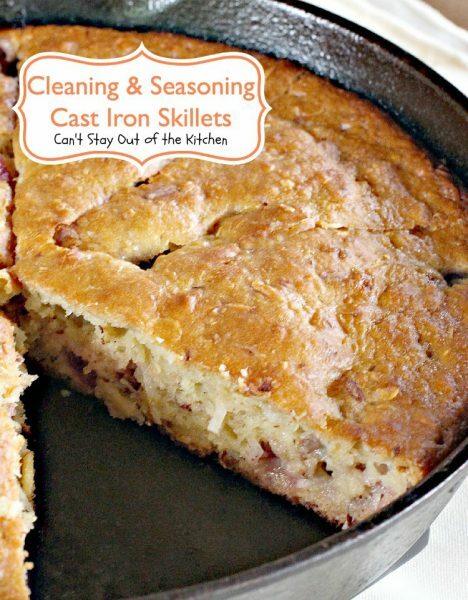 It’s baked in a casserole dish. The hardest part is peeling and cutting up the squash. 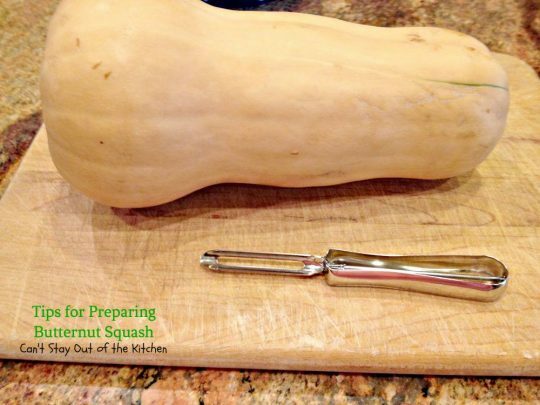 If you don’t want to mess with that you can put the squash in the oven and bake it for an hour (or longer for the big whoppers! 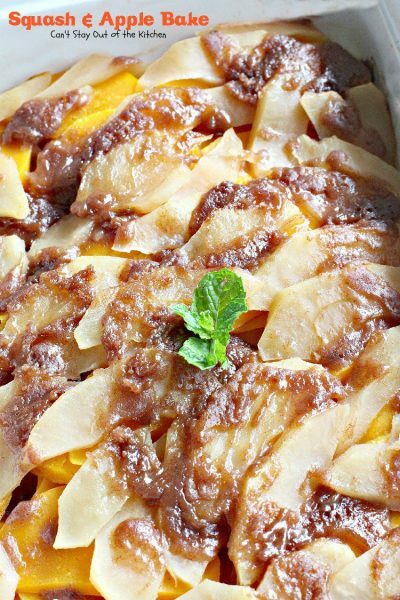 ), then it will easily peel and you can use the contents in recipes as you desire. Yeah. I’ve found it easier to peel it with a vegetable peeler rather than paring the skin off with a knife.